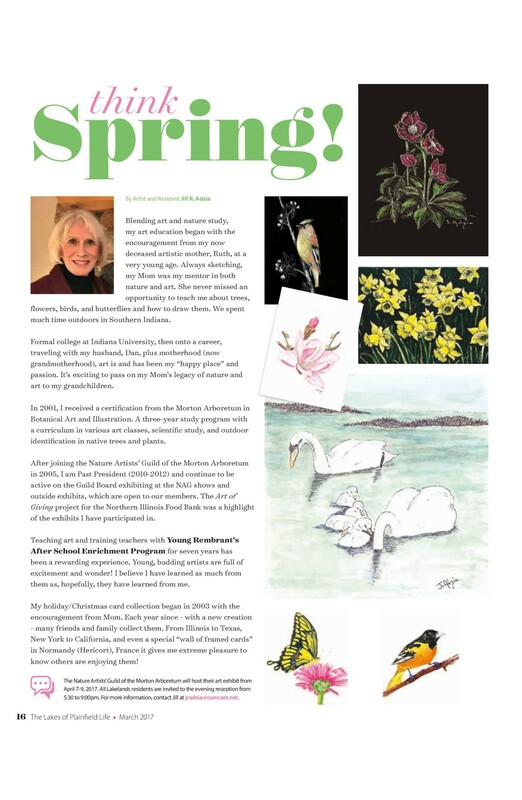 Congratulations to former Nature Artists’ Guild president (and current Fundraising Chairperson) Jill Adzia, who was featured in the March 2017 edition of The Lakes of Plainfield Life! Please click on the image and enlarge on your screen to read the article. This entry was posted in Member Artwork, Member News. Bookmark the permalink. A HUGE THANK YOU, Denise….. a wonderful surprise on the blog! A HUGE THANK YOU for this wonderful surprise on the Blog…., DENISE!!! I am truly touched by my fellow Guild members response..it made my day! “Jill-ie Jill” is the best…Congrats on this article featuring your artwork! Wonderful to see local artists recognized. You are so much fun to work with and you keep me laughing! That’s wonderful! Congrats to Jill! Wonderful article and art Jill! Congrats Jill! Your work is beautiful!